This little couple sits in somebody's front yard and is hidden by the winter branches and such. I caught a look when I was passing in the car and made Vinny (my husband) stop and go back so I could go back and take pictures. I think they look wonderful in sepia. 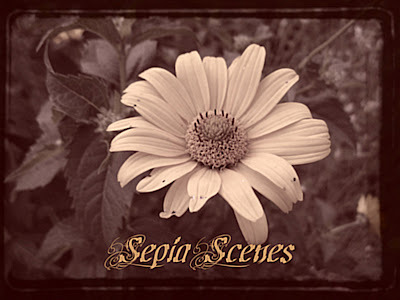 So post your Sepia Scenes and I'll come visit as many people as I can. Please sign Mr. Linky and leave comments. I love comments. This post will be up through today and all day Thursday! to all my friends who are celebrating! Don't they just love it when we make 'em stop so we can "get the shot"? This one was worth it though. Of course, there are some times when you just can't stop. Like I couldn't when I took mine for this week. I found a sepia from my New Orleans trip and decided to post this week anyway. It was burning a hole in my computer. "Made my husband stop." If my husband had a dollar for everytime I made him do that...Of course, they're driving, how else to we get these shots! Wow, the homes have some cute and beautiful statues in your area. And it's nice that we have understanding hubbies! Puppy down in the corner is saying "Me too. Met too!" In addition to my sepia submission, check out this idea for a new meme. I often spot things as I'm driving or riding the bus that I just have to photograph! If I were you, I might have done the same thing as well. Go back and take a shot of it. Very heart-warming, gives me a feeling, it's an old couple living there in that house. Oh, aren't they cute. I love the darker background, it makes them stand out so much more. What a sweet little statue! I'm glad Vinnie stopped for you. When I ask my husband to stop he always tells me someone is going to shoot me. lol. Love frozen in time and caught in sepia! It was worth stopping for! Fun! I specially love her socks and pup! Lovely couple :)! I'm glad they caught your attention. It looks so sweet in sepia. What an adorable looking couple, and in sepia the composition is beautiful. What a fun photo! great sepia! These two define the 'in-love' wonderful stage. They are, shall we say, cute! I'm just like you Mary. My hubs has turned around for me many times - Bless their hearts! 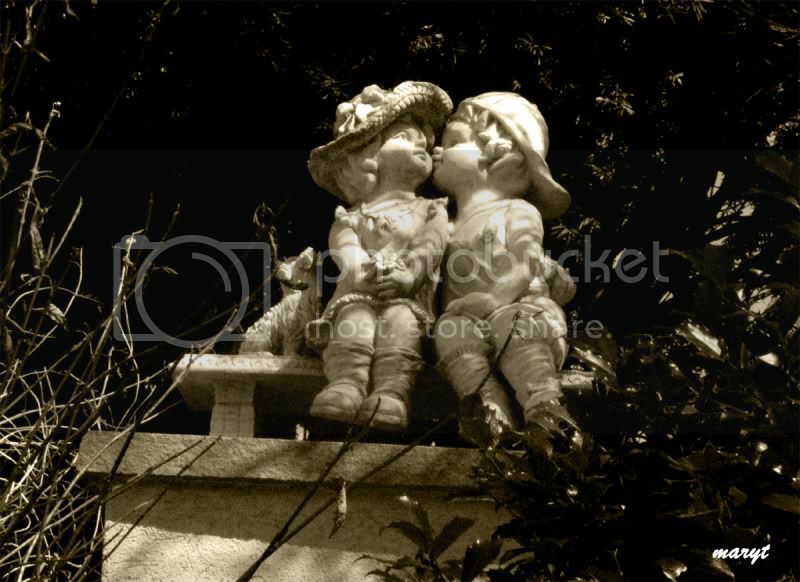 I love this little couple in Sepia. It is very fitting. I have followed your lead this week and traveled into the cemetery. :) I've been wanting too and finally found something I really liked. Love the pose of these figurines! There is such a sense of complete adoration in their "body language". Classically enchanting in sepia! I love this cute statue and it looks great in sepia, Mary. Mr. Linky is not taking my URL - I tried three times. whew, I got it now. That's so cute! I wish we had such front yards here in my city, too! And it looks even better in sepia! I'll try to post mine:) Late again! I have mine up now! That is adorable Mary! Mine will be up as soon as Cyberspace decides it's 12:30 A.M! I'm going to bed now - but I will be around to visit in the morning! Joining for the first time. Beautiful and lovely sepia scene :)! sepia scene #25 come by for a dip . . . ? What a very sweet statue of the couple. There is such an quaint charming feel to this picture. I love your sepia today! Very handsome couple to be sitting in a yard under the bushes!! Really cute! Have a great day!! Today's sepia pic is from my last vacation. But there's also a post (no pics yet on Blogger, sorry) about my London vacation - what I've done so far.